[New for 2013, May-August] So Edy's / Dreyer's has several new selection out for the summer. First we looked at the slow churned Salted Caramel Pretzel, but let's take a look at the fruitiest of the limited bunch. 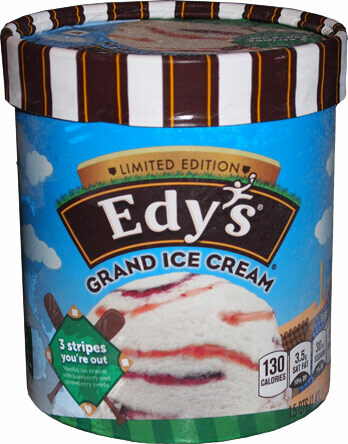 This is Edy's 3 Stripes and You're Out grand ice cream. 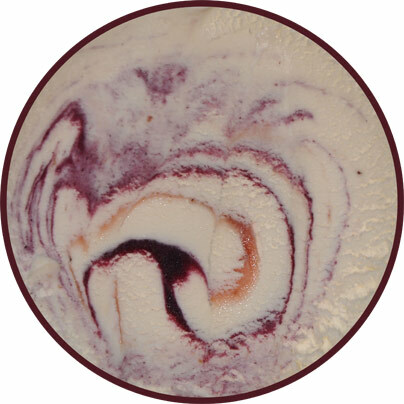 It's vanilla ice cream with blueberry and strawberry swirls (in a nice baseball inspired design). You know I dig strawberry and now they've gone and mixed that with an elusive blueberry swirl. I'll admit that I've got decent hopes for this (while being afraid of that fake blueberry taste that is prevalent in so many products). Now I've got a little surprise for you guys on this one. See, I was at Wegman's when what do I see but my beloved Pretzel Cone! I was so excited! Now I have known that the Cone Guys made these and other cones for awhile now, but I just wasn't willing to part with $8+s&h for a five pack to find out if they were good. Well, here they are in front of me at just five bucks. Oh I'm excited! Man, I want to say it's been over 20 years since I've had a pretzel cone. I had forgotten how rough and salty the cone feels in your hand. It's so cool looking though isn't it? Mmmmm, even smells like a true pretzel. Man I've missed these things. 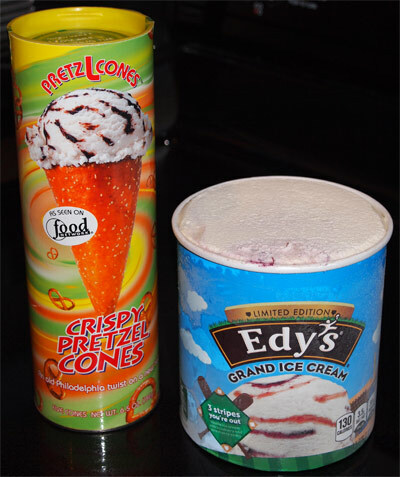 Ok, I start at the top of my cone with just some pure Edy's ice cream. Now you'll notice in the container that it seems to be like 85% blueberry swirl, but the taste comes across much more balanced then that. I like it, I really do. It's tasting great on this hot hot night (with no breeze.... and lots of humidity... and no air conditioning). 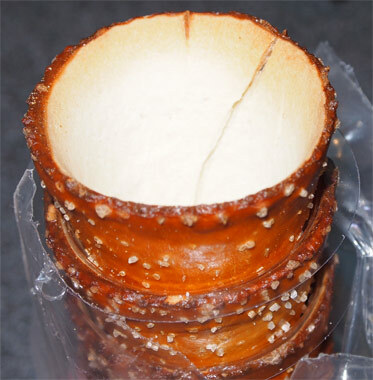 As I start digging further into my treat, the pretzel cone starts to become a factor. You wind up hitting the cone as you lick the ice cream. It's basically a giant salt lick. 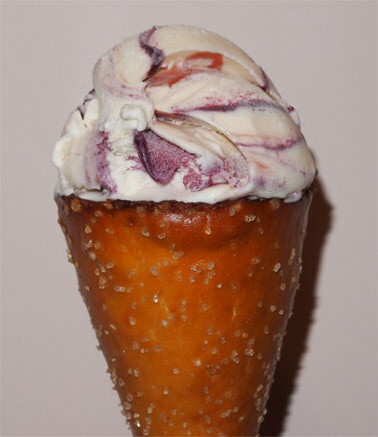 This isn't some timid waffle cone, or some sweet chocolate coated cone, this is the mighty pretzel cone. >crack< Wait, did I forget to mention the top cone came pre-cracked? I expected a mess but I figured the taste was worth it... and it is. It's so crunchy and thick. I'm so 11 years old again. It's just such a thick cone. It has to be to deliver a realistic taste... a salty, salty realistic taste. And a salty aftertaste. What do you expect when one cone is 23% of your daily sodium intake? To be fair, I decided to wash down the salt with a little more ice cream. If you go back to scooped container picture, you'll notice how Edy's has made the nice touch of not adding coloring to the strawberry swirl. I think the contrast of the two swirls just adds that visual pop to the ice cream, though there is always part of me that goes "why isn't it red like jelly?". Anyway, I don't really feel like I'm getting lulls and surges of flavors. There are mild variations, but nothing crazy. There's also a distinctive lingering berry filling aftertaste, and I mean that in a nice way. It's trying hard to be authentic, and I appreciate that here. My only complaint is that they call it three stripes when it only has two swirls. Yes, I know the base coloring is the third stripe... but you know I love to argue semantics! I am not so sure about that one but I am happy that they brought back Take the Cake! Didn't they or another company do a variation on the blueberry/strawberry swirl awhile back and called it something else? I vaguely remember eating something similar and I think it was a patriotic theme. Also I NEED THOSE CONES! Those look crazy amazing! Danielle, bah I know exactly what you're talking about but the flavor escapes me. I was thinking Perry's All-American flavor but that's not it. This is going to drive me mad. hahahahaha, you're now the third or fourth person who's told me that, too funny. apparently a lot of us think chocolate & pb when we think salty and sweet.... technically i do have some downstairs I could try. Nick, I wanna say Breyer's made some 4th of July flavor with it. It was patriotic and I think it was the froyo!